Yakima, WA – Borton Fruit’s new merchandising display bin has arrived! This bin started being designed shortly before the PMA show back in October. Borton took mock-ups of the bin to the show to get direct feedback from our customers, and we took everything that was said into account! We implemented a few minor changes to the original graphic and among our Sales Department, came up with our final display piece and overall feel for where we wanted our branding to go moving forward. “Consumers are highly established with the Washington Apple Brand, and we made sure the ‘Fresh Washington Apples’ popped from the high density orchard picture we placed behind as our main graphic,” Said Lindsay Ehlis, Sales & Marketing. “The natural wood around the outside of the image makes for a very nice, real wooden bin feel,” She continued. Also included on the front panel is a QR code allowing the consumer to scan and know instantly where they are getting their apples from, the Washington Apple Logo, and the “Fruits & Veggies – More Matters” logo created by the Produce for Better Health Foundation. 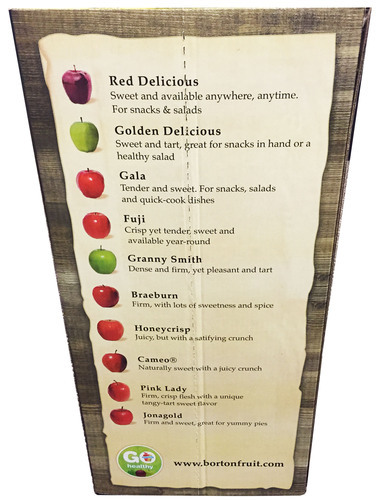 The side panels feature varietal descriptions that will assist consumers in choosing apples for every eating and cooking experience. This display will fit anywhere in the produce department and is very easy to put together. You simply open the bin at the creases, insert 4 empty tray pack boxes (40lb pack), insert the cardboard piece that fits over the top, and put your fruit in. This display will work for both bagged and bulk product. We have also finalized graphics on a Soft Net Bag Header film that will be arriving at our facility within the next month. The bag header ties in with our bin as far as the graphics go. The front side of the film will have the same image and wording as the bin, and the back side will provide the consumer with nutritional information, health benefits and storage tips. 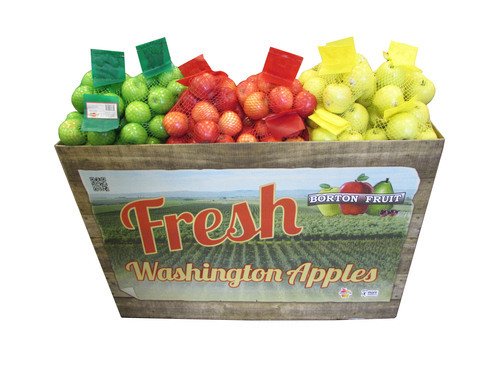 Contact your Borton Fruit Sales Rep today if you are interested in our new merchandising bin!